Teamie provides you a platform to find out how your child is doing in his/her classrooms. Tracking your child’s activity can prove quite useful for his future. As a parent, you can track your child’s activity through Calendar events and To-dos on Teamie mobile apps. You can see the list of upcoming items/tasks your child has to do in various classrooms and advice your child to finish his/her task on time. 1. As soon as you login to your Teamie account, you will be able to view your child To-Dos on the home screen. 2. 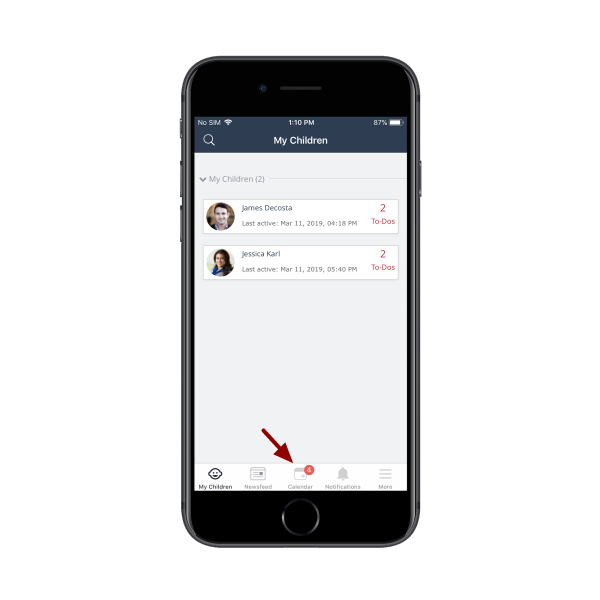 To view the calendar events of your children, click Calendar at the bottom navigation bar. The calendar icon will have a badge counter which will show you the sum of the To-Dos of your children. 3. By default, the 'Upcoming' section will show the calendar events of each day of the week (in which your children have events) starting from the present day. The calendar events will include the events for lessons, tasks and assessments (assignments and quizzes). You can tap View Full Calendar link below the events to view full calendar of the child. 4. You can switch between your children calendars by tapping Calendar and selecting the required child from the resulting drop-down. To view more about the Calendar events behaviour for learners, click here. 5. Tap Later to view the calendar events of next three weeks. A green tick will be shown in front of an event in case it has been completed. 6. Tap Past to view the overdue events (calendar events whose deadline have passed) for your children whose deadlines have passed. The number of overdue items will be shown only for the last 30 days. i.e., system will hide all tasks that are more than 30 days overdue to avoid unnecessary clutter. 1. To view the To-Dos events, tap to toggle the Show only ToDos toggle. A red dot appears infront of the ToDos events to distinguish them from the calendar events in the Upcoming and 'Later' section.